This past February marked the thirtieth anniversary of the EDSA revolution. A generation has passed since Filipinos in the millions stared down the tanks and troops of the Marcos regime on Metro Manila’s main highway that the revolution was eventually named after. To those who lived through it, now reaching middle age, EDSA was an unbelievable, transformative, even spiritual experience of how faith and the people’s will could peacefully topple a dictator. For younger Filipinos without any memory of EDSA, it already seems dated and simply another chapter of the Philippines’ tumultuous political history. What exactly did EDSA accomplish? Thirty years on, why does it matter?It’s worth going back to September 1972 and the very beginning of martial law to fully understand the context of the events that toppled Marcos in February 1986. After a staged assassination attempt on Secretary of Defense Juan Ponce Enrile, Marcos declared martial law, granting himself powers far beyond those allowed to him under the Philippine constitution. Enrile was the architect of martial law, creating the legal and military framework for what would eventually be known as the Bagong Lipunan or “New Society.” According to Marcos, the New Society would transform Filipinos into strong, disciplined, and law abiding people. The instruments of change would be the armed forces and police, which Marcos would turn into the pillars of his regime. By the early 1980’s, cracks began to appear in Marcos’ rule. The Philippine economy, once one of Asia’s fastest growing, was in free fall and tens of millions of Filipinos lived in grinding poverty. To add insult to injury, Marcos and his family flaunted their ill gotten wealth as Filipinos faced more hardships. But the weakest link in the system was Marcos himself. He was suffering from a debilitating case of systemic lupus erythematosus, requiring kidney dialysis and extensive treatment that interfered with his ability to govern. Worst of all, he had alienated key figures responsible for upholding his regime. Defense Secretary Enrile, author of martial law, was isolated and dissatisfied with his position within the government. Marcos had also passed over Fidel V Ramos, a distant relative and high ranking general, for promotion to AFP Chief of Staff in favor of the incompetent but loyal Fabian Ver. An even more volatile element was added to this combustible mix of power politics. Gregorio “Gringo” Honasan was a young, ambitious, and charismatic military officer whose career, along with many others in his generation, had been put on hold by Marcos’ preference for older, more reliable cronies. The President refused to allow Honasan and other young officers to rise in rank lest they displace the power and positions of older generals and admirals personally loyal to him. Honasan created a secret organization within the military which came to be known as RAM, the Reform of the Armed Forces Movement. RAM was filled by angry young officers, many from elite Special Forces units, all eager for a chance to shake up the military and government hierarchy. Defense Secretary Enrile was quick to see the potential in such a group and quietly cultivated Honasan as his protégé. As Marcos’ health declined, the power of the opposition grew, especially around the fiery and eloquent Senator Ninoy Aquino. Aquino had been imprisoned during the 70’s but released and sent to the United States for a life-saving operation. There, he became a lightning rod of opposition against Marcos’ regime. Upon his return to the Philippines on August 21, 1983, he was assassinated, with the culprits responsible for ordering his death unknown to this day. In the court of public opinion, Marcos was guilty of Ninoy’s death and rather than squelching the opposition, resistance to his rule increased, now coalescing around Ninoy’s widow, Corazon Aquino. This was the stage in the middle of the 1980’s in the waning years of the Marcos regime. Enrile and Honasan were biding their time for an opportune moment to strike at the ailing dictator, knowing the poor state of his health. At the same time, Cory Aquino had become the face of the opposition. Because of her status as a housewife, political outsider, and widow of the martyred Ninoy, she proved extremely difficult for Marcos loyalists to attack or defame. Showing one final spark of the political daring and intuition that brought him to the Presidency two decades before, Marcos called for a snap election to prove once again his popularity and mandate to rule. As Cory and Marcos began to campaign, Enrile and Honasan began planning a coup. All their destinies would come together during four spectacular days from February 22 to 25, 1986. Fearful of the real result, Marcos and his loyalists rigged the election in their favor. The fraudulent Marcos victory was denounced by international observers and the Philippines’ own Committee on Elections, or COMELEC. The powerful Catholic Bishops’ Conference of the Philippines also opposed the result. But the real action would come from Enrile and Honasan’s disgruntled rebel officers. Sensing the regime’s weakness, Honasan planned a coup in which the commandos would seize Malacanang Palace, TV stations, and key military bases around Metro Manila. It’s an important point to remember that EDSA did not begin as a spontaneous expression of people power against dictatorship. In its original form, the toppling of Marcos would have been a violent takeover with Filipinos killing each other in the streets of Manila. Unfortunately for the would-be revolutionaries, and miraculously for the Filipino people, loyalist officers discovered Honasan’s plans and Marcos ordered the arrest of Honasan and the other coup leaders. Enrile and Honasan scrambled as Marcos turned the tables on them. It was now, that Enrile showed his skills as a consummate politician and insider. He contacted Fidel Ramos, head of the Philippine Constabulary (today the PNP) and asked for his support. The rebels who had once planned to attack the Presidential Palace now holed up inside Camp Crame and Camp Aguinaldo. Though Marcos could have ordered his vastly superior forces to crush the rebels immediately, he opted to negotiate. It was a critical error. Ramos and Enrile bought time negotiating with the dictator as Ramos convinced military units all over the country to change sides. Ramos was still resentful of being passed over for the top job in the Philippine military, AFP Chief of Staff, and was far more respected in the military than Fabian Ver, Marcos’ top crony in uniform. The most powerful endorsement of the rebels came from Jaime Cardinal Sin. Cardinal Sin and other church leaders urged their parishes and religious orders to go out and support the rebels, even at personal risk. Led by priests, monks, and nuns, some two millions Filipinos streamed onto EDSA, concentrating around Camp Crame and Camp Aguinaldo. Now, even if Marcos ordered his men to attack, they would not be able to defeat the rebels without killing untold numbers of fellow Filipinos. With Enrile, Ramos, Cardinal Sin, and the teeming millions of Metro Manila out in the streets against him, the balance of power had shifted decisively against Marcos. Military units faded away and joined the rebels until finally, Marcos was only master of Malacanang. A US military helicopter whisked him and his family out of the palace to a base in Ilocos, then to a plane towards exile in Hawaii. In the next few days, thousands of Filipino would wander wide eyed through Malacanang Palace, discovering Marcos’ dialysis machine and Imelda’s infamous shoe collection. After two decades in power, the most formidable President in modern Philippine history practically faded away. Though the plot devised to overthrow him called for violence and bloodshed, there had been virtually none. The most iconic images of this peaceful revolution would come from EDSA itself, where nuns prayed the rosary in the face of soldiers and tanks. It was not hyperbole for many Filipinos to describe the events of the EDSA revolution as a miracle. Continuing the dictatorship, civil war, and all the worst case scenarios involving bloodshed and loss of life had been avoided. Perhaps the political miracle was the involvement of millions of Filipinos once the revolution was underway. The presence of the masses in the revolution transformed what would have been a violent, selfish grab for power by Marcos insiders into a noble, heroic effort where the Filipino people were the true heroes. Because of “People Power”, Cory Aquino would become President and return legitimate, constitutional government to the Philippines. The age of martial law and military rule was firmly ended. Because of the unlikely, maybe even miraculous events of EDSA, young Filipinos grew up in a country that was not destroyed by civil war or still enduring a corrupt dictatorship. A fragile respect for the rule of law returned to the country after EDSA, spearheaded by Cory Aquino and other reformers, seeking to repair the damage done by martial law. Of course, EDSA did not right all the wrongs done during martial law. Many of those who disappeared were never found and many who had committed terrible crimes were never brought to justice. The Marcos family, for better or for worse, has returned to politics. Imelda Marcos is a representative in Congress, with son Bongbong a Senator, and daughter Imee governor of the province of Ilocos Norte. The Aquinos became a political dynasty of the first class because of the actions of Ninoy, then Cory once she was President. Corazon Aquino and her son Benigno Aquino III are the only mother and son to have become Presidents of the Philippines. For Ramos, because of his leadership during EDSA and the respect he commanded in the military, he became Defense Secretary under Corazon Aquino, then President in his own right in 1992. Gringo Honasan and Juan Ponce Enrile are still in politics as well, both as senators. Though some of its key figures are still with us, the EDSA revolution is gradually fading into the background. While it was imperfect, it remains an example of how a nation can avoid breaking upon the rocks of civil war and domestic strife. For Filipinos too young to remember or who were born afterward, we owe a peaceful childhood and upbringing to those three days in February thirty years ago. EDSA will continue to be the standard for what Filipinos were at their best, what they should be, and what they can be again. “I want to be buried with that.” That’s what a Filipino-American World War II veteran shared with General Taguba in hopes that the sacrifices that he and thousands of his colleagues made during the conflict will finally receive the same recognition that Native American codetalkers and Japanese-American veterans have received: the Congressional Gold Medal. Service before July 1, 1946, in the organized military forces of the Government of the Commonwealth of the Philippines, while such forces were in the service of the Armed Forces of the United States pursuant to the military order of the President dated July 26, 1941, including among such military forces organized guerrilla forces under commanders appointed, designated, or subsequently recognized by the Commander in Chief, Southwest Pacific Area, or other competent authority in the Army of the United States, shall not be deemed to have been active military, naval, or air service for the purposes of any law of the United States conferring rights, privileges, or benefits upon any person by reason of the service of such person or the service of any other person in the Armed Forces. The oath that a quarter million Pilipino recruits made years earlier by joining the United States Armed Forces Far East (USAFFE)—that pledge of "faith and allegiance...to the United States of America" and to "obey the orders...of the president of the United States"—seemed to have meant nothing in the eyes of the Rescission Act. Thus began the decades-long fight for recognition, a battle that continued long after the war’s end. We’ve heard of the Fil-Am veterans who chained themselves in a park named after Douglas MacArthur, the USAFFE commander who led the initial defense and eventually the liberation of the Philippines. We’ve seen bills submitted to Congress over the years to bring such recognition only to end up not gaining traction. Eventually some progress was made. The Naturalization Act of 1990 allowed veterans to become US citizens and one-time payments were delivered to them in the Filipino Veterans Equity Compensation Fund, which was embedded into American Recovery and Reinvestment Act of 2009. But even then such compensation ($9,000 to non-US citizens and $15,000 for US citizens) seems miniscule compared to what American veterans have received since the end of the war, with benefits ranging from medical to the GI Bill. And by then, thousands of Fil-Am vets have already passed away, thus reducing the number that needed to be compensated while 42% that are still alive and have applied have since been rejected. I recall ten years ago, when I’d envision General Taguba’s face every time I heard something about the Abu Gharib scandal. I was inspired to see a Fil-Am in the upper echelons of the Armed Forces. Now he’s leading the fight for another injustice, one that after seven decades is finally seeing progress -- but only after thousands of veterans have already passed away. Writing to members of our congress seems painless compared to the literal and symbolic battles that these individuals faced, but it’s powerful enough as a final gesture of gratitude before they pass on. Fellow minority veteran groups received their recognition after years of constant lobbying. Now it’s time for our Filipino-American World War II veterans, our lolos, to receive theirs. For updates on this important initiative, check out and like the Filipino American World War II Soldiers Recognition Project Facebook page. A few weeks ago, the island of Taiwan was brimming with student protests over the country’s recent trade pact with the People’s Republic of China. After the ruling party, Kuomintang (KMT), had passed a Cross-Strait Service Trade Agreement with China without any review from the Democratic Progressive Party, the opposing party. Promised to bring more life to the stagnant Taiwanese economy, the trade pact was feared to give even more control of Taiwan to China. 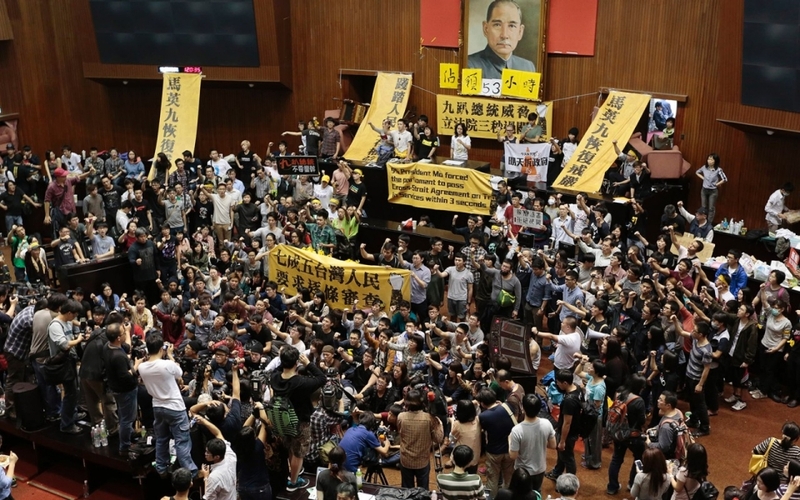 Students were enraged over the KMT’s blatant dismissal of the public’s request for clause-by-clause review of the already controversial bill. Earlier this year, from March 18 to April 10, Taiwanese students took their protests to not only the streets of Taipei but into the chamber of the Legislative Yuan and Executive Yuan. I was talking to my American friend about the difference between Occupy Wall Street and the recent student protests in Taiwan, nicknamed the Sunflower Movement after a florist had donated 1000 sunflowers to the cause. He predicted that the Sunflower Movement would gain more success because the students had a specific goal—a call for new legislation that would monitor the China-Taiwan agreement process and to postpone the enforcement of the trade agreement until the legislation is enacted. And for a while, that future seemed very likely. My friends would return from protests, and praise and inspiration would just spill out of their mouths. In the beginning, the protests were peaceful and strong. The professors at my university would encourage their students to join in. As a foreign exchange student, I couldn’t take part. My exchange program sent clear and direct emails warning me of possible deportation if I got involved, but that didn’t stop a lot of people from joining in on the singing, the chanting, the occupation of the governmental buildings, etc. Being so close to the action, which was only a few bus stops away, was intoxicating. Protests in the US seem too far off and distant for me to feel connected because the country is huge and even events in the next state seem light years away. Here in Taiwan, however, I was so close to the action—my friends littered my newsfeed on Facebook with updates about the protests, every conversation mentioned some news, the university’s campus was covered in flyers and sunflower decorations in support for the students. Despite the abrupt surge of violence during the latter part of the Sunflower Movement, the protest suddenly came to an anticlimactic halt. The adrenaline from the protests was languishing just as midterm season came around. Students came back to homes and directed their energy back to their studies. Just like that, the protests were over. A lot of my friends went out of their way to detach themselves from the protests. They viewed them as dumb and useless, and they were particularly smug after the protests had quelled down. But the protests were anything but dumb or useless. Even though the outcome was not at all ideal, it was still incredibly inspiring to feel the power of the students. I felt so close to change, even though I as an American would not directly be affected by this protest. People from all walks of life took the students seriously because they were organized and driven in their desires to right the wrongs the Taiwanese government had done in order to pass the Cross-Strait Agreement. The weeks of protests and the students’ clamor for change were enough to force negotiations between the student leaders and the President. Although seemingly fruitless, the negotiations signaled that students are a force to be reckoned with and are more than just their school textbooks. These students have ambition and drive outside of academics, and they are the future of Taiwan.